Day 6. Cesar is doing well, and showing us a calm submissive smile almost consistently. Nobody has lost any fingers or toes, and there has been no bloodshed! Now the real question is, what are all of those people going to do when this dog is rehabilitated? Remember all of those people that were dead set on euthanizing this dog because he was too aggressive? Ok, I give, it is still early on, and we shouldn’t count our chickens before they hatch! Moving on now. “Cesar” is still fearful of the hose when I clean the kennel, and still hides in his crate. I’m not surprised, and plan for this to be a work in progress. He’s still eating out of my hands just fine several times a day, and actually seems to look forward to my company. I’m sure this is something he is not used to at all. As I walk dogs by his kennel run, he comes up to the side looking for a bit of attention now. Progress. I attempted to try and wipe down his face today, it was a no go. A warm washcloth coming towards his face was not high on his list of priorities. Fair enough. We will try again tomorrow! What a wonderful story for this dog. He goes from the streets where kids are throwing things at him and he is exposed to all of Mother Nature’s harsh elements and no food, to the shelter where he cannot be treated for his massive wounds and is set to be euthanized, to a Dog Training and Rehabilitation Center for Complete Canine Wellness. Here he gets a very quiet country atmosphere, his own private quarters with a pool, breezy shelter, Organic dog food, and soft voices and friendly canine faces that greet him everyday. Wow! How lucky is this dog? May an abundance of all good things find come to all of you; it has to this sweet rescue dog! Another day, another pack walk. “Cesar” has shown more interest in other dogs as I prepare them with backpacks, and leave for our pack migration walks. He seems to have a curious look as if to say, “I wonder where they get to go every morning?” One thing we do know is that he has been migrating by himself for quite some time. I am eager to take him along on our morning pack migrations, but that will have to wait at least two weeks until all of his many sutures come out. Today is a fairly busy day around my facility, cleaning, working, and dogs checking in for boarding. I’m proud to share that there was no lip curling at all while hand feeding Cesar today. He actually greeted me respectfully, head lowered, and tail slightly wagging. Its good to see him moving forward, and trusting me more. His mouth still looks to be slightly swollen, and fairly painful to me. As per the doctors’ orders, we are to keep him on soft food for at least the first 7 days. Hot dogs, lunchmeat, and high quality canned food: Cesar Millan’s brand, Blue Buffalo, and Wellness. He seems to be having difficulty navigating the food bowls with the Elizabethan collar on, so it actually gives me more time to sit with him several times a day and hand feed him. Here he will get the opportunity to be fed by the pack leader, very symbolic for him, and a great trust building exercise for he and I. Today is a typical routine for Cesar. Keep him quiet and comfortable. No extra added stress while he is healing, and work on building trust. Today is a good day! Rise and shine! Another pack walk, and more social time with our friend Buddy, er, uh, Cesar. Sorry, he is Cesar now. Today he is a slightly more alert, but still not sure on his feet. I’m also taking into consideration the condition of his teeth and mouth and assuming that he has not eaten very well at all in weeks? Maybe longer? Lack of good nutrition, and underdeveloped muscles are obvious. He certainly has a way to go before he can have a clean bill of health! Although he is still incontinent, he has spent more time outside of his crate watching all the activity today. I have purposely spent even more time outside with my pack working obedience, and playing. I want to lead by example. I want him to see what it is like to be apart of a pack, and what the pack looks like when they are sharing good energy and having a great time. Today Cesar gets a chance to watch a pack of dogs share plenty of affection, interact with me, and get rewarded with treats for performing basic and advanced obedience commands. The power of the pack. Of course we still have the kennel run to hose out rather often. He is still not happy about this, and he still hides in his crate, but today he didn’t shake. This is forward movement. Excellent. Feeding went much better today. At 5 different times today I sat in his kennel with him and fed him hot dogs and lunchmeat. My pack lined up next to the fence of the training field observing ever moment! Its 6:00 am, and as I let the other dogs out on the training field Buddy is still fast asleep in his crate. Feeling safe and secure, resting, and healing. Just what the doctor ordered. Kim and I prepare all the dogs for a pack walk, backpacks on, and off we go. Be back in an hour or so Buddy! As we return back from the walk we notice Buddy has come out of his crate to join the world, congratulations little doggie! We also notice Buddy is experiencing a good bit of Urinary Incontinence. He’s lying there, sleeping, and peeing all at the same time. Lovely. So now our Buddy gets to be sore, recover from surgery and lay in pee. Ok, time to go in the kennel run and clean up. This does not make for a happy dog, so we start on the outside of the kennel run with hose on a gentle flow, not full blast, and we start to rinse. Keep in mind at this point Buddy is still not very coherent at all. He is still coming out of his Acepromazine coma from the day before (125 mg is a very large dose! ), and he was under anesthetic. Just the sight of the hose, and the gentle flow of water sends Buddy into a bit of a frightened frenzy. Wobbling, nearly losing his balance at every step, he stumbles and scurries back to his crate, dives in, and hides in the back. Ok, so this tells us that at some point he has had some very bad experiences with a hose. Buddy’s behavior is very consistent with a dog that has been hosed down crudely, and often. Some use the hose as a way to punish a dog, hose him into a corner, or correct them from barking. I’m sure we can all agree this is definitely not a responsible, or moral method. A hose should not incite fear, but perhaps a little well earned play. Just as Lucius, Dharma, and Laila can hardly wait for me to initiate a game of play-in-the-hose while I water. What’s more fun then three dogs running around, jumping, and play biting the water as it showers them, and my grass? Future goal: see if I can teach Buddy to enjoy the water, and hose during a warm summer day. Today’s goal however, not so demanding on Buddy. Our focus for the week is to allow him to recover. This is a time for healing, and a time to build trust. After all, doesn’t Buddy deserve it? Goodness, just thinking back through Buddy’s journey thus far is nearly unimaginable. No worries Buddy; be happy. Throughout the day, about every hour I just walked in the kennel and fed him a hot dog. Each time I got a bit of a lip curl as he tried to pull his head backwards, and away from me. After the first bite from this hungry boy the lip curls stop and he eats rather gently from my fingers. Excellent. Lather, rinse, and repeat every hour. Get a lip curl every hour, and then he eats gently. Could be worse, I’m a happy camper. Unfortunately, due to the incontinence, I have to hose out the kennel often. This does not make for a happy dog, and each time I go in he scurries fearfully into his crate. Lori and Claudia come for a visit, and chat about our new friend Buddy. Or should I say Cesar? Lori contemplates changing his name to “Cesar” in honor of the man that has made all of this possible. Ok, so we will call him Cesar and see if that name resonates with our rescue. Time to call it a day. A very long day, but a good day! Off to relax my hand, soak it, and enjoy a good nights sleep! It’s bright and early 5:45 am (actually it’s dark and early at that time! ), taking care of my pack, and waiting for Lori to arrive with the goods. Buddy’s Acepromazine is on the way, and soon he will be sleepy and ready to go for another ride! Or so I think. Agreed! A second Ace is given, and we wait 20 more minutes. Lori is sitting in the kennel run with him, renewing her bond. He is most certainly not happy with me, and the sight of me coming near him does not arouse good feelings. I hang back outside the kennel run, hand rather stiff, sore, and a bit swollen, playing cheerleader from the outside. No skirt and pom poms today! We’ll save that for another day when I don’t have a dog dead set on putting me in my place! Ace #3 in hot dog and down the hatch. One for Buddy, one for us, one for Buddy, one for us – just kidding Dr. Saldanha! Ok, so we wait another 15 minutes. 75 mg of Ace should knock this guy out! What is wrong with him? Clearly its fight or flight mode; adrenalin is kicking in and he is fighting for his life (in his mind). He has no idea we are here to help him, not hurt him. Waiting. Ok, one more try for Lori. Buddy is standing and looking at her, very clear communication coming from him... Lori walks in slowly, approaches Buddy, and in one swift movement he lunges teeth bared, growling, snarling, snapping, then he jumps strait up in the air about 12 inches from her face and snaps those teeth together loudly, clearly getting his message across! Stunned, Lori stands there looking at me in disbelief. I’m sitting on my back porch steps, with a “what’s wrong?” look on my face, she clearly has never had a dog bare teeth, growl, lunge and snap at her – especially all at the same time, in the same morning, more than once! I giggle to diffuse the nervous tension for Lori hoping it will make her feel better, and say something like, “Nah, don’t worry about that, if he really wanted to get ya he would have. He’s just reminding us he is not comfortable with this situation at all.” Lori backs out of the kennel run, with the old, “ok, your turn” look on her face. This is definitely a first for Lori. Welcome to the world of dog training and rehabilitation. Keep your arms and legs inside the train ‘cause this here’s gonna be a wild ride! Hang on to your hats and glasses folks! I think this is about the time Lori discovers a quiet, contemplative moment to express a minor concern; she has something to tell me. Uh oh. Can you hear the ominous music in the background? My heart sinks. I’m thinking, “Ok, this is gonna be good, I can feel it!” She proceeds to tell me that Claudia on some level thinks that possibly, this just may have been a little more than she expected? Just maybe? Perhaps that this Buddy dog just may be a little more than she originally thought she would be working with. She is questioning herself at this point and pondering many things. I think this is a good time in her life for self-reflection perhaps? Ok, so WHO IS going to take this dog? [Insert Jeopardy theme song here.] And the winner is Lori! Whew! I was a little bit worried there for a moment. You know that feeling when your heart is either going to sink, or jump right out of your chest like a scene from the movie “Aliens?” Little sigh of relief, and then a little conversation about what Lori is in for, now that she has be snarled, snapped and growled at. No problem she assures me. She is ready, willing, and able. She is dedicated, and this is her path… this is Buddy’s path. This is my path. With a quick phone call to the vets office to confirm we “can” give him all 5 tablets (125 mg!) of Ace, we pull out another hot dog and down the hatch it goes! We wait another 15-20 minutes while we create the next plan of action and hope that these two pills send him snoozing! Time has escaped us, and we realize we have to get this dog to the vets quickly. It has to happen soon. It’s now approaching a bit after 11:00 am, and they close for lunch at 12:00 noon. As I begin to explain to Lori how to use the tennis racquet to protect herself, the look on her face says it all. I am doing the rest of this. Ok, no problem. I thought perhaps that since she has already built a bond with him that it would be less stressful for him to have her lead him out and to her car. Not the case. He was not happy with either one of us on this day, so as the professional, it’s now my turn to teach! Tennis racquet in my very sore and stiff hand, simple chain leash in the other. I walk into the kennel run, Buddy automatically backs into the corner, lips curled – he is not having anything to do with me in his kennel or coming near me. He comes at me, I feed him the tennis racquet, and biting at it furiously he clamps down and refuses to let go. Realizing that he has to let go at some point, I wait. He finally lets go, and tries to dart away from me. He moves towards the child’s pool in the kennel run, I follow, racquet pressed up against him. He turns to bite again, and again. Buddy decides that choosing flight into the pool is not an option he wants to explore. He steps back and leans into the kennel run choosing avoidance. Ok, that’s better. Fight didn’t work. Flight didn’t work, and we are not ready for submission yet, so we choose avoidance. Chain leash in my left hand, tennis racquet in my right hand; right hand feeling a bit like it would prefer to freeze up and drop the racquet than have to continue holding on. Ouch. Buddy is pressed up against the chain link kennel run, his head leaning firmly against it. My right hand and trusted tennis racquet preventing him from lunging forward or making contact with me, left hand works on sliding the leash over his head. Now, he is not about to make this easy for me. He does not want this leash around his neck and he figures as long as he keeps his head pressed against that fence I can’t get it on. He’s right. I realize that if I move the tennis racquet out of position he now has a clear shot at me, but also realizing I need to use this racquet to push and slide the leash between his head and the fence, all the while prying his head away from the fence and towards me. Can you picture that? So, as I pry his head away and push the chain leash around his head and neck I am actually pushing his head in the direction of me, the one he wants to bite, giving him a clear shot. Out of time and options, have to get him to the vets. Leash slides down around his neck, tennis racquet has time to come back around and protect me, and we are now moving our way out of the kennel run. Using a tug-release-tug-release motion all the way out of the run, across the patio, down the walkway, and to the car directly in the driveway Buddy puts up an extremely good fight, lashing out at the chain leash and my fancy protective Cesar Millan Tennis Racquet. Thank goodness for both! He can’t cut him self loose, and I am protected. Now, here we are at Lori’s car. Her beautiful car. Plan is to open both doors, attach an extra leash to the current one to give us more to work with, get him close to the door opening, throw the leash through the back seat so Lori could catch it and while I use the racquet to protect my self and herd him in the back seat, she pulls. He gets in and we close both doors and there you go. Not so much. Let’s call this a disagreement which ensues next to the car, under the car (took both of us and a lot of strength to get this wedged doggie out from under her car! ), behind the car, and then again next to the car. With all of this sedative in him where the heck is he getting the energy to fight? Yikes! About 20 minutes goes by, Buddy is putting up a good fight but wearing down slowly. Goodness, he has 125 mg of Acepromazine running through him, he should be zonked out by now! He is biting at the leash less furiously now, but there is a bit more damage to the loyal and dedicated tennis racquet. Lori’s beautiful light tan leather seats now have blood splattered about along with the inside of the back door. The back door also took one for the team; two bloody punctures later. Right about now Lori is getting really worried that he may never give up and we have about 20 minutes to get him over to Arlington Animal Hospital. I see he is getting weary and remind her that he can’t fight forever. At some point he will submit and see the back of the car as a safe haven. Buddy sits propped up against the car door, we wait, and wait, and wait, I want him to do this on his own. A few minutes go by, he looks at me and his archenemy the tennis racquet, and then looking at the back seat he slowly climbs in, lies down and submits. Oh good job Buddy! Perfect, and not a moment to spare! Doors closed, Lori gets in, I run to open gate and call AAH; She’s on her way! Don’t lock the doors! She’s on her way! The receptionists are fabulous there, and thankfully with Dr. Saldanha, they wait as Lori high tails it down Van Buren Blvd! Sigh of relief. Did I mention just how incredibly fantastic everyone is at Arlington Animal Hospital? I love them! Buddy, our lost soul is finally on his way to recovery. The one thing he really needs is immediate veterinary care. I only wish he knew just how much we want to help him. He is on his way to a place that will take very good care of him, give him the very best medical attention, and make sure he wakes up in a much healthier state physically. I will take care of him emotionally. It is very sad this poor guy has had to go through so much in such a short amount of time, but one step leads to another, and finally I feel so much better knowing that he will be taken care of, and his pain will end. Perfect timing. AT&T advertising rep arrives as I am opening gate for Lori. Time to go in the house, sign contracts, get a bottle of water and wipe the dripping sweat off of my face. Whew. Good to be back in the air conditioning. Also good to have a very understanding AT&T rep who loves dogs, and a good story! Lori calls 30 minutes later to inform me they (AAH) would like us to bring them a crate so they can put him in it after surgery. Easier for him to wake up in this, than for us to now try to get him back in crate and then get him back home. No problem. I was still finishing up with AT&T, so she had plenty of time to get back to my place and then we’d take my Honda Element and run to get a giant crate real quick for this guy and drive it back down to them. Lori back at my house, I finish up business, Petco 1 mile from me and on the same path to AAH. Easy trip; walk in, point, I want that one! They help us get it down and load it up along with a nice big bag of Blue Buffalo dog food for Buddy when he’s able to eat. On the road again, I just can’t wait to get on the road again… ok, can you tell it’s been a long week? Back at AAH; drop off super giant crate to fit 65-pound Husky/Shepherd mix and plastic cone lampshade Buddy will be wearing. By the time we finally get there they are almost done with his full tune up, and are just now washing him. Good. All is nearly complete for this guy to heal. We drop off crate and dash out of there so they can do what they do best! On the road again, I just can’t wait to get on the road again… ok, I promise I wont do that again. Couldn’t resist. By this time its got to be about 3:00 pm. I look at Lori, “You hungry?” I think we had a very weary conversation that went something like, “Oh food? Yea, starving! Must get food. Need energy. Can’t go on much longerrrr….” Thank goodness we were just about to reach a Subway! Make mine a 6-inch veggie on Italian Herb & Cheese with extra provolone, add avocado! Yum! So ready for food! Thank you so much for lunch Lori! Oh to actually sit in the air conditioning and eat super yummy food. Wow, can I just tell you how good that felt? Heaven. It’s about 4:30 pm and we are now back at Arlington Animal Hospital, chatting with the girls at the front desk, and getting ready to go back to a room and hear all about our new friend, Buddy. Doesn’t take long at all and we are ushered into a room, and then Emma appears like magic to give us the run down. Short and sweet, here is what you need to know about Buddy medically. He was neutered. This is almost a given, but thought I would mention it to you. He most likely has internal parasites, as well as external parasites. We are talking highly contagious Ring Worm, in addition to Fleas, and Ticks and whatever else is brewing inside. He also has three cracked teeth that seem to be old injury. He also has holes in his lips that go from the inside to the outside, and some that go from the outside to the inside. He has infection, puss, abscesses… no wonder this dog is so thin and miserable! No wonder his mouth is bleeding! He’s an absolute mess! Now, just for a moment, imagine you have all of that AND you are furiously attacking a snare pole repeatedly and a tennis racquet! Can you imagine the pain? So, the three teeth come out, and the holes are sutured. I’m sitting here thinking about the misery of us having a toothache, or one tooth pulled. I’m having a real hard time trying to understand the amount of pain this dog has been in since these are old wounds. He went a very long time without any medical attention at all. No animal should ever have to suffer for any reason. We would never allow a human to suffer in those conditions. I am however still very grateful that he was transported to me. As a business owner I have to consider that the safety, health, and well being of my dogs and my clients’ dogs have to come first. My clients trust me to keep their dogs safe when they are boarding here. Their dogs become part of my pack, and as pack leader it is my responsibility to protect them in all ways. Had I picked up and transported Buddy myself I would have had a car full of Blood and ooze, Fleas, Ticks and Ringworm. This is not good to subject my own dogs to, or my clients’ dogs. I would have had to completely sterilize the inside of my car. Let me say this again,.. Thank You Greg Beck! Here is my reminder to everyone: Be careful about judging a situation too soon. The Universe may foresee a better way. Trust that everything happens for a really good reason! Alright, we get the rundown on Buddy, go back out to the front desk and because Lori and Claudia just wanted to save this poor dogs life, they are the lucky winners of a $2,637.42 vet bill. Does anyone out there know of organizations that help with these types of bills? One of the gals at the front desk asked us, but I don’t personally know. If you would like to help Claudia with Buddy's vet bills, or know someone who can, please contact Claudia at ClancyLab@msn.com. We are gonna need help getting this guy out of the Element, and into the kennel run. Quick phone call to dad and brother, help is on the way. We pull out a giant crate with sleeping dog in it, carry it inside the kennel run and remove the door from it. It’s about 5:30/6:00 pm and no doubt Buddy will be out until tomorrow. Perfect. This poor guy needs lots of rest; it’s the best way to heal! Now that Buddy will be in a peaceful, drug induced deep sleep until tomorrow, it gives us girls a chance to sit and talk about a plan for this sweet soul, and let my pack play for a while before dinner. As Lucius lays watch next to Buddy’s kennel, darkness begins to fall, and it’s time to call it a night. Time to feed my very hungry pack. By this time I am thinking about a hot bubble bath and a glass of wine, then slipping into a deep slumber myself. May an abundance of all good things find you! There is an older woman who lives by the side of a river up in the mountains, the Himalayas. She was a divine soul. She carried with her bread in a sack. One day she was sitting by the edge of the river where she lived, and as she was looking at the river bed she noticed a precious stone. Now, not just any precious stone, but a precious stone as big as her hand. She picked it up and realized that with this precious stone and its value, she would have a lock on abundance and prosperity for the rest of her life. Such was its value. And as she was sitting there she put the stone back in her bag. And a man, a traveler came along and noticed her sitting by the edge of the river. And he asked her, he said, "I'm hungry, I've had nothing to eat, could I have something to eat?" And she said, "Of course and she reached into her bag and she took out a crust of bread and handed it to him." As she did this the traveler noticed the precious stone gleaming, and he said to her, "I'd like to have that. Could I have that please?" And she said, "Of course", and she reached into the bag and she handed it to him. Now, he knew, being poor that this was the answer to his success he had always wanted, and the abundance and prosperity, and he left. And the next day he came back. He talked to the woman, and he said, "I'm giving you this stone back, but I would like you to give me something even more precious than this stone." And she said, "What would that be?" He said, "I would like you to give me what you have inside of you that allowed you to give me that stone." Monday, July 27, 2009 - Part 4, The day is over. Reminder: Earlier I talked about “red tape” and a whole lot of other stuff that may have been right, or wrong, may have been done purposely, or not; things that may or may not have been fair, etc. Let me just lead by example and say, “Thank you Greg Beck! Thank you Devore Shelter! Thank you Lawyers representing the shelter!” First, it truly did not matter what this dog looked like, I had already agreed to take him on. It was just my curiosity to see him, but had no bearing on my decision to help. It simply would have been a courtesy, and good gesture on their behalf to allow me a quick peek. Second, I am so grateful that I did not have to try and get this dog in my car, or anyone else’s, as he would have bled and oozed, and peed every where! Yuck! What a mess and what a struggle that would have been! I am so grateful that was in their truck and not mine! Lesson: No matter how bad things look or seem, that is just what you are seeing on the surface. I am truly grateful that Greg Beck was able to hand deliver with the Officer, this dog to me in their own truck! The already very long, and hot day would have been far longer if I would have had to do this on my own! I am very grateful for their assistance! Can you imagine if I would have had to do that by myself? Possible, but yikes! Never judge a book, or a situation by what you see on the surface. Things have a way of working out sometimes! Buddy is now resting comfortably, and quietly in the kennel run. My pack is taken care of and sleeping. Time to take care of me. I remember from my own First Aid & CPR/First Responder class that it is good to use both ice and heat on an injury such as mine. Reduces swelling and loosens up all of the muscles, tendons, and ligaments that have been damaged. Promotes healing. So, heat = nice hot bubble bath by candlelight! Ice = a glass of wine with ice cubes in it! HA! I have just the formula: Soak hand in hot tub for 5 minutes, then place icy cold glass of wine in hand, sip, repeat every 5 minutes! 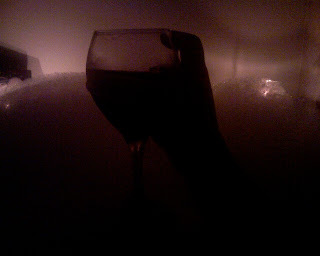 With a glass of wine in my good hand I head off to a long, hot bubble bath. With nothing but gratitude and positive thoughts swimming through my tired head, my sore, swollen and bruised hand loosening in the hot water, and the soft sound of Lucius sleeping next to the tub I begin to drift off to a very peaceful place. Monday is done, and Tuesday is sure to bring a whole new level of excitement to our story. Sweet Dreams my friends! Look for more of Buddy’s story later today, or tomorrow. Jen and the pack, Lucius, Dharma, and Solomon! So now Buddy is in my kennel run, he is a mess physically and emotionally, we know he needs emergency medical care, but we can’t touch him! Now what? As we sit here observing Buddy it is easy to see on the surface that his coat is in beyond bad shape. He is matted, and gnarly. He is filthy like an Alaskan Oil Spill, he is very much underweight, and he is showing clear signs of stress. His mouth is not in good shape at all. I can’t quite tell what is going on in there, but the way he was biting and lashing out at that snare pole it is no surprise he has one heck of a bloody mouth. Could this originally be from when the Humane Society Officer picked him up? Could this have happened at the Shelter? Perhaps this has happened on his way here, or when we took him out of the truck today. I’m not sure, but one thing I do know is, it looks bad. Really bad. Claudia and Lori inform me that this injury was not from today, but has been there for a while and looks to be getting worse. Side note: I fully believe in not judging someone by what one see’s on the surface. I completely believe that one should be given a fair amount of time to prove what is truly in one’s heart, and to show who they really are. This is your positive reminder not to judge anyone without fully understanding if they are truly showing us who they are, or if there is more beneath the surface that we have yet to learn. With a dog, it can take on average 3 days – 3 months for him to show his true colors. You can compare this to the beginning of a new human relationship. This is the “honeymoon” period. It can happen with a foster child. In the beginning they may be on their best behavior so as not too unload all of their baggage at once revealing far more issues than one thought, and therefore being shipped off to some new unsuspecting family. It is the same with dogs. The first few days to weeks to months the dog may be laying low so-to-speak, and then once the dog feels more comfortable and trusting, bam! There ya go, the entire set of issues surface. Dogs lead or follow. This all depends on whether or not you are willing to lead or follow. If you lead fair and confidently, the dog, or pack will be happy to follow you. If you are unable to lead, the dog, or pack knows instinctively that someone must lead. This is when we see dogs take over a human pack, dominance issues arise, and all of your unwanted behavior issues come to the surface. Take moment right now, and consider whether you are doing your pack justice or not. Are you a strong, confident and fair pack leader, or do you need a bit of help? There is no shame in asking for help. It is unrealistic to think we can be perfect in all areas of our lives all on our own. Its how I found Louise L. Hay and her book “You Can Heal Your Life.” It is also why I commonly work with my Personal Fitness Trainer Mike Iasparro. How do you think I came across Cesar Millan’s methods? I needed help back in 2005, I asked The Universe to guide me, and then I saw a man on TV walk a pack of dogs that were once deemed aggressive. Ask someone for help; you will be glad you did. Back to Buddy. Its obvious we need to get him to the vet. Its also clear that there is not a chance in hell that we are getting anything around that dogs neck and getting him into any car to transport him to the vet. It’s also getting dark and all vets are near closing. Our first thought is perhaps we can find a mobile vet willing to come over and take a look at him. While Claudia looks in the phone book I call my longtime trusted Veterinarian Dr. Roy Saldanha at Arlington Animal Hospital. After explaining the situation to him he wisely informs me that it truly is best to get Buddy to him first thing in the morning. Even if he were to come out tonight, given Buddy’s highly defensive, fearful and aggressive nature there may not be much he can do. Even if he tried to sedate Buddy, if something were to happen all of his trusted life saving equipment is back at the hospital. These are all very good points, and completely understood. I go back outside to inform Claudia and Lori, as well as to set a plan. Step number 1: Let’s all acknowledge that we have done everything we possibly could for Buddy today. He is no longer at the Devore Shelter, and he is no longer on death row set for euthanasia. He is now here, at my very peaceful home far away from barking, chaos and death. He is safe, and he knows this. Within 45 minutes we watched him begin to relax and feel far more comfortable. Lori spent a lot of time with him in the kennel run comforting him. I believe he knew on some level that what she was telling him was the truth. He would be ok. Step 2: Buddy has been through hell and back during the past 10 days. He was tired and needed to sleep. He needed to learn to let go, and know that it was all right to do this. He has two very large pools of fresh drinking water in the kennel run, lots of shade, and quiet. He needs to sleep, and he needs to just observe what it is like to be in a home, surrounded by a pack of happy dogs. This is what we see Cesar refer to as the Power of the Pack quite often. Its dark now, and nearly time for all of us to get ready for bed. Tomorrow is a new day. There will be no food for Buddy tonight in prep for surgery tomorrow, but there will be peace and quiet for him. Step 3: Lori is to go to the vets first thing in the morning, get a bottle of Acepromazine, bring it to my home, and we are to start sedating Buddy so we can get him to the vets and get him taken care of. We know he needs to be neutered, and we know he needs to have his mouth looked at. We know he needs a bath. All on our ‘to-do” list for tomorrow. Claudia and Lori have bonded with this lost soul, Buddy. They believe he is non-aggressive, and simply afraid. They want him out of here at all costs, and want to give him a fair chance at life. Vikki also wants the best for Buddy; wants him out. Greg Beck would like to see Buddy have a fulfilled life, but obviously has many valid concerns. Here is the sticky part. Buddy has been deemed unadoptable, and aggressive. The Devore Shelter has lawyers. They are put in place to protect the shelter. No harm done there. In fact, we can all understand, and appreciate this concept. Shoot, everyone has lawyers. Even I have lawyers. It is their job to protect their clients. We are grateful for this. According to the lawyers that protect the shelter, if they are to release this dangerous dog into the public, there must be rules, boundaries, and limitations. Sound familiar? Ok. I’m good with this. So what are they? Vikki has to sign a release to the shelter. Claudia has to sign Vikki’s contracts/release. Claudia and Lori have to sign my contracts/release. Ok. Legal documents signed. Easy. Now, here is the fun part. Allegedly,.. yea, I do like that word! Allegedly. Thank you Kathy Griffin. “Allegedly” Buddy is so aggressive that I am not even permitted to see him while he is locked away in cage number 88. He’s behind steel, but like Hannibal Lechter, I am not allowed to even see this dog that I am agreeing to help release, and give life to. Interesting, eh? Nope. I asked. They said no. Yes, you heard correctly. I am agreeing, sight unseen, to take on the responsibility of rescuing, rehabilitating, and saving a life, but I am not even allowed to walk back there and see him through the kennel. Really? Oh yea. Does that make any sense? NO! What is this dog going to do to me through a steel kennel door? Can we say “red tape”? This makes no sense at all, and is one of the silliest things I have ever heard; but lets go with it. This is one of the rules the lawyers (?) came up with, and it wont hurt me one bit not to see the dog, so we just let that one go. I know that it doesn’t matter what this dog looks like, I’m taking him out of here anyway. Perhaps they were just concerned that once I saw him I would change my mind? Perhaps they were just concerned for my safety? No matter. Let’s stay positive and choose to believe that their hearts are in fact in the right place, and safety was their first concern. They are just doing their job; don’t shoot the messenger right? According to lawyers (allegedly), this dog MUST be released to a qualified Trainer/Behaviorist. If no qualified Trainer/Behaviorist will accept responsibility for this dog, then he cannot be released to the rescue, and to me. Oh yea. He can ONLY be released to a rescue, and then to me. I get to play the part of the qualified Trainer/Behaviorist. But can I just see what kind of trouble I’m getting myself into? Pretty please? Nope. Can’t see the dog. Not allowed. Lawyers Rules, Boundaries, and Limitations. This is what I do, this is what I specialize in, no big deal, I’m taking him on no matter what, just thought it would be a nice gesture. Again, there is no judgment here on my behalf. Remember when I talked a bit about “red tape” and not passing judgment, sometimes these things seem to work out? So, in my mind I think, this is strange, but ok. Lets go with the flow. When can you deliver him to my property? They don’t know. Approximately? Nope. They have to wait for an Animal Control Truck to come in, load him up, and then drive out there. Sigh. Ok, so I will just cancel my day, rearrange my clients, and drive around the Inland Empire all day. Fantastic. Are ya feelin’ the love and respect? I just wanted to do a good thing and help this dog and these lovely people out. If we are going to make things difficult, please, don’t make them difficult for the only person that is volunteering to do the right thing sight unseen. What’s that saying, about shooting the messenger? So off to home I go. Stop and get dog food on the way, get home and take care of dogs, etc. Wait for Buddy, he will be here sometime today, when a truck is available, and Greg can assist an Officer to bring him to me. Sigh. Reminder: Not all things that seem to be bad really are. No sense in being negative and judging. It did give me time to stop and get dog food right? Put gas in the car; take care of my dogs, etc. It worked out just fine. Truck opens [drum roll please]…. That’s Buddy? Really? Him? Boy did he look bad. Bloody mouth, growling, mangy, tangled and matted, backed in a corner, scared for his life. Ok. So finally, this is Buddy! Ha! Merry Christmas to me! Under all this mess he is actually a pretty cute dog. Not a happy one, but not bad looking – I’m thinking positive here. Sure he needs a tune up, and a fresh coat of paint, but he has possibilities! Step 2: Get snarling, growling, fearful, ticked off dog out of Animal Control Truck. Ok. I have my trusted nylon slip lead that you commonly find in vet offices and grooming facilities. No problem. By the way, Mr. Millan, where are you getting them for .35 cents? I have looked and cannot find them that cheap. Can you share please; I need a new lot of them! Animal Control Officer sitting in air-conditioned truck. Just so all of you know, she was very sweet. Truly a very lovely person, and extremely helpful. I can’t seem to remember her name right now, but she had good energy, and a great sense of humor. I open door to Buddy, he displays his, “touch me and I break your face” smile. Fair enough. I lower my eyes, not challenging him, slide myself in between the door, and the truck so he can’t rocket himself out and take off. I have leash in my hand, and I slowly take my time getting my hand closer to him as the minutes go by. And the minutes do go by. Greg and I have conversations in between. A waiting game ensues. Buddy is not happy, does not care whom I say I am, and wants nothing to do with me, and he has no problem getting his point across as I cross his line in the sand. Here comes the first set of piranha like bites to my hand. Ouch. Fair. If I were he, and had been on his journey, I would have done the same thing. The good news is he only used his front teeth and did not use his canines or back teeth. Bad news is he used an awful lot of force and it hurt. Score - Buddy 1: Jen 0. My hand stays in the same position. If I had pulled my hand back he would have won that space, and possibly tore the flesh. My hand stays in the same place and lets him have at it. He realizes I’m not backing off, and he can’t win. Let’s stay positive. I’m (my hand) maybe 12 inches from his face. He’s not happy and I’m not backing off. I’m not challenging, but I hold my position and I visualize what must happen. He must come out of that truck with me on my terms. If he were dominant, and confident those bites would have been full mouth bites and I would have had stitches. The fact that he was insecure, and fearful was a plus. I am grateful. Round 3. As Greg and I have idle chat about the situation, he says, “Awe, just through the leash around his neck.” Or maybe he said, “Can you get the leash around his neck?” Or, something to that effect. Don’t quote me, but you get the idea. I jokingly make a comment about not being able to throw well at all, but since I’m about two feet in front of him lets give it a shot. Score! The slip leash is around his neck and I pull just a bit tight so it wont slip off, but not tight enough so that he can’t breath of course. Time for a little victory dance! Ha! Score - Buddy 2 : Jen 1! As I go to give him a light tug in my direction, my come hither doggy look, Buddy turns to the leash, chew, chew, snap. Victory dance is over. Leash is snapped clean and we are back at square one. Sigh. Score - Buddy 3 : Jen 1. Yep, it is certainly that time. He can and will easily snap through nylon and leather, so we must go to the snare pole. Keep in mind that he has had some horrific experiences on this thing, but lets also keep in mind that it was invented for dogs just like Buddy. Safety first. By this time we have also been standing out here in the direct sunlight for sometime between 30-45 minutes, the Animal Control truck running, I’m inhaling fumes, Buddy is inhaling fumes, and Greg and the Officer don’t have all day to hang out. I’m sure I could have whipped up something for dinner, but I’d bet they would prefer to get home at some point and see their families. The snare pole it is. This was my first experience actually using one. I have seen them, I have held them, I have played just a bit with them, but I have never actually put one on a dog and hauled his frightened and fighting self out of a truck. The Officer was kind enough to give me a lesson, and awesome enough to assist me on my first try! Thank you! Goodness, I wish I could remember her name. So here he comes, fighting, biting, kicking and bleeding out of the truck. Alligator rolls, and all. Ok, so we can’t get Buddy to walk on his own, and I can’t blame him. There is no doubt he was under quite a bit of stress to say the least, but we had to get him out of that truck eventually, and into my kennel run. A little pull, a little waiting, a little fighting, a little dragging (as safe as one can be) we finally get him back into my kennel run which is directly under my kitchen window and just a few feet out of my back door. End result; there is smeared, splattered, and dropped blood all the way down my very long driveway, into my back yard, down the walkway, through the patio, and into the kennel run. My cute pink shirt is splattered with blood and now becomes a rag, and my hand is beginning to tighten, swell and bruise. Fun. Staying positive, the hard part is over, and Buddy is now in my back yard in his safe haven! We all celebrate a slight victory dance! Claudia is now the proud owner of a brand new rescue dog, Buddy’s life has been officially saved, I am now the proud owner of a brand new rehabilitation case, my first blog, and Greg was able to assist in the rescue, re-homing, and transportation of one less dog his shelter has to euthanize. Whew. We all thank each other, shake hands, give good-luck wishes, lets keep in touch, and the rest of all that good stuff.